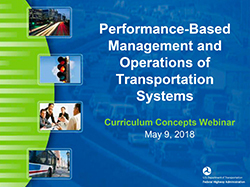 The Federal Highway Administration has been supporting a project aimed at developing and preparing a fully annotated Model Curriculum on Performance-based Planning for Transportation Systems Management and Operations (TSMO) that can be used for undergraduate and graduate courses in Transportation Planning and/or Traffic Engineering. The curriculum has been developed as a series of eight modules with case studies and PowerPoint presentations that can easily be incorporated into both undergraduate and graduate courses. Join us for a quick introduction to the curriculum and hear from faculty members Dr. Stephanie Ivey (University of Memphis) and Dr. Mohammed Hadi (Florida International University) who have been incorporating TSMO components into their courses.